Now at last we're getting to the interesting part: compiling and running our own modified kernel on the Nexus! We are of course going to pick most of our information from the official kernel building guide, though, unlike the guide, we're going to go all the way through, and not stop before we are actually running our recompiled kernel. This time, we'll use Linux as our development platform (more convenient). The first thing I need to warn you about then is, if you're running a pure 64 bit distro (such as Slackware x64), you're going to find that you must install a 32-bit compatibility layer to run the 32 bit debug utilities. This is a bit annoying, and I'm not going to guide you through that, so make sure you sort your platform issues, okay? Receiving objects: 100% (580/580), 124.64 MiB | 715 KiB/s, done. Resolving deltas: 100% (146/146), done. Ideally, of course, you'd want to add this export into your .profile or something so that you don't have to set it up every time. Dude, where's the kernel source? Receiving objects: 100% (3195022/3195022), 850.15 MiB | 716 KiB/s, done. Resolving deltas: 100% (2634067/2634067), done. As can be seen from the above, expect a download of about 850 MB. Huh, there's nothing in there? Mmmm, OK, maybe the flo branch then? Checking out files: 100% (41678/41678), done. Branch android-msm-flo-3.4-jb-mr2 set up to track remote branch android-msm-flo-3.4-jb-mr2 from origin. We have a kernel — now what? Aaaaand, that's pretty much where the Google guide stops. What do you mean, you also want to run your newly compiled kernel on your device? If that's the case, then you should download more than 16 GB worth of build files from the infamous aosp (Android Open Source Project) suite —I wish I was kidding, see below— and then figure out how to inject your kernel in there. Good luck! My usage data (in MB) after downloading the full aosp. The 16 GB of the full aosp (I was already 2 GB in for that day, hence the 18 GB above) sure put me dangerously close of getting a not so friendly call from my ISP for going over the monthly quota (again, not everybody is running on Google Fibre), so I might try to spare you this trouble. If you're not going to download the aosp to try to figure out this mess, the first thing you should know then is that, as opposed to what is the case on most devices, testing your kernel on Android isn't as simple as pointing your bootloader to it. It must be included into a custom boot image (boot.img) along with a RAM disk and some other stuff. The format of this Android boot images can be found in the bootimg.h of the mkbootimg tool from the android platform/system/core source. I guess we have to start somewhere, and we'll need to produce our own images, so let's start by fetching and recompiling mkbootimg then. NB: Since I duplicated and improved on the original tools (see below), you can, and probably should, use https://github.com/pbatard/bootimg-tools.git instead of https://android.googlesource.com/platform/system/core for the git clone URL below. Receiving objects: 100% (19302/19302), 5.87 MiB | 655 KiB/s, done. Resolving deltas: 100% (11674/11674), done. With the above, we'll be able to invoke mkbootimg and optionally mkbootfs to create an image. If you follow this guide closely, you'll see that we're not even actually going to use mkbootfs, but I kept it there just in case. Use a backup utility on your rooted Android device, and save the partition that contains the boot image. For instance, if you installed TWRP when rooting your device, and boot into recovery, then you will be able to save the 16MB Boot partition, which is what we are after. Download the latest factory image (at the time of this writing, it's JSS15R, 359MB big), extract it in full (tar then zip), and then pick the boot.img image from the zip (in JSS15R, that would be boot.img within image-razor-jss15r.zip). You also want to be mindful that bootloader-flo-flo-03.14.img is the bootloader image, and NOT what we are after. Also, don't let the fact that in one case you get a 16MB file and in the other one that is less than 7MB worry you. The 16MB one is just padded with zeroes, which won't matter when we access its content. For the remainder of this guide, even as it requires a 359 MB download, I'll go with using boot.img from the factory image. Next thing we need is a way to unpack that boot.img file. There are a couple of unpack-bootimg.pl/split-bootimg.pl perl scripts dating back from 2008, so we can pick one of those and then use a binary editor take a look at the .img and extract the addresses and parameters we should provide mkbootimg, and try to cross-reference those with... Aaaaagh, I can't stand it any more!!! What the £$%^& is wrong with Android developers?!? Why the heck aren't these unpacker scripts providing you with the full set of parameters you need to use to repack an image, instead of having to look at a binary header, or some mysterious settings file in a 16GB repository to find them? Also, why, in 5 years, hasn't anyone, including Google, improved these tools and scripts? The thing is, even mkbootimg has issues and won't work on Windows (when compiled with MinGW) due to the use of non-Windows friendly open(), read(), write() et cetera. I'm gonna write my own unpack tool in C, fix mkbootimg in the process, and put it all on github. Sheesh, as if I didn't have better things to do... I hope you're happy! Now at last, you have the minimum of unmkbootimg, mkbootimg and mkbootfs installed in your path, and we can get going with our testing of the kernel. Now, THIS is what you want to be able to do from an Android image unpacking tool. Is it really that much to ask? That 365a6e0 after the g (for 'git') in the version number, that's the SHA1 from the git commit we had to pick to compile our kernel. All in all, this looks fairly good. And a quick look to the root filesystem (through adb shell or through ssh) will also confirm that our it_works file is there, so we can also add whatever we want on the initial filesystem. Neat! For the record, if you actually modify the source of your kernel, you should see a -dirty qualifier appended to your kernel version, which is normal, and won't prevent you to run a modified kernel. Now what are you doing still reading this guide: get hacking your device already! Thanks for this post! I was able to build and run a modified version of the stock kernel within a few hours. I really had no idea what I had to do in order to install the kernel. The boot.img portion of this post was a lifesaver! Glad to hear it's useful. The reason I wrote this guide is because I was in the exact same boat as you. Hi Pete, just wanted to say a very big thank you. This post and your rooting one worked like a charm on a Nexus 7 (grouper) - using Ubuntu 13.10 running in virtualbox. great guide and i love it. can u post how to add modules in boot.img and they will automatically be copied in system/lib/modules. Thank you so much for writing this! Still reading it through and working on a hammerhead kernel. Thanks for all the information! You've done a great job - finally there is "unpack" utility: unmkbootimg that make sense. I was pissed off by some scripts trying to find binary sequence inside the 8/16MB image! Absolutely perfect!!! You Rock! The only tool that worked for my image. Thank you. Hi,can we control the version string after every reboot phone?Now We team are try to build up the simulator just like android phone,and we need to control kernel version's value after flash rom.Have some method? I have a problem, there is no Wi-Fi capabilities with the new kernel. Thanks bro, builduntu + this guide, fastest route to a custom kernel. Let me confirm, this whole thing will work with Builduntu running on VMbox? Hi my friend, I just received my nexus 7 2013 32go wifi, but very disappointed by the 58-59hz screen refresh rate reported by Retroarch and a little apk to test the refresh rate... It makes many sound cracking emulators... So I tested stock roms 4.3 to 4.4.4, custom roms and some custom kernel, but same thing, screen refresh rate still @58-59hz. So please I'm looking for a stock kernel with 60hz fixed, do you know a way for that ? Many thanks. Hi Pete, thanks for this tutorial. Worked all like a charm. When I finally got my DT2W to work, I had a strange issue in booting the myboot.img...."FAILED (remote: dtb not found)" Any idea what I made wrong? Thanks however. i got stuck up in menuconfig command. It gave me a linker error. Could you please guide me in this regard. A great article..if you could help me how i could dual boot it with the stock one.. Thank you very much for taking the time to produce this article. 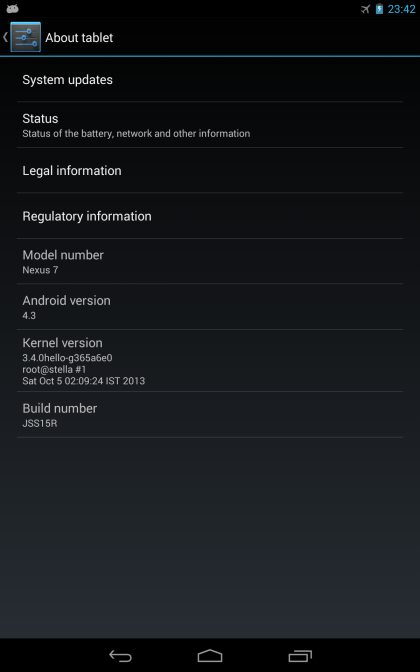 As a complete noob, I have managed to build a kernel for my Nexus 4 which works! This is, by far, the best guide I found. Since I do not know Linux, I neither know what this means or how to fix it. Any help is appreciated. @Sam Faragalla Did you find any solution to this.I am also getting the same error. How can I compile nexus 5 kernel in permissive mode?